Content has become an essential currency for marketers. Though companies have been producing informative content such as white papers, case studies, webinars, research and videos for many years, until recently there has been no single term to describe these marketing efforts. Now these tactics have been gaining significant traction as content marketing, an umbrella term for a wide range of interactions with specific audiences – from thought leadership research aimed at an influential blogger, to a video aimed at a potential customer. As the content marketing industry continues to expand (the UK Content Marketing Association estimates that in 2012 the UK content marketing industry alone was worth around £1 billion), it is becoming more and more essential for companies to have an effective content marketing strategy. However, creating such a strategy represents a huge challenge for many companies. Who should you be speaking to, and when? What should you be saying? Which types of content marketing tactics are most effective? Finally, how can you measure the effectiveness of your content marketing in financial terms? 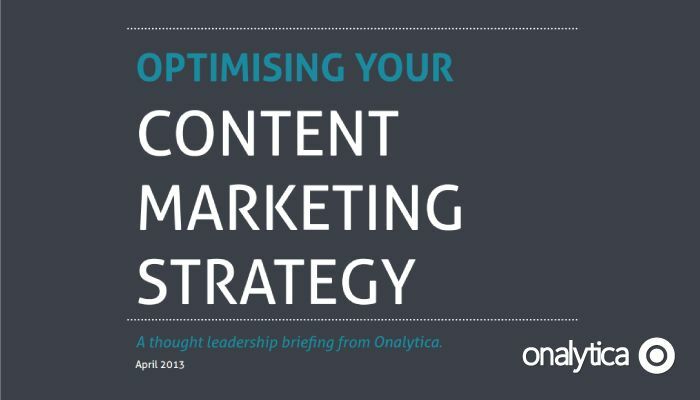 Our white paper explores how companies and content marketers can optimise their content marketing strategy to get relevant content in front of the right influencers at the right time – and to measure and improve the ROI of content marketing activities. The white paper is available here, as a free download. You may also be interested reading more about Onalytica IRM, our new influencer relationship management platform designed to scale your influence and improve the ROI on your content marketing activity.